An elegant, risk-free solution to the climate crisis can be found literally beneath our feet–in the soil. By harnessing the immense power of photosynthesis, we can convert atmospheric carbon, a problem, into soil carbon, a solution. CFS’ launched Soil Solutions to advance this under-recognized opportunity to mitigate climate change and, by providing people with a hopeful and accessible solution, empower them to rebuild soil carbon in their community. 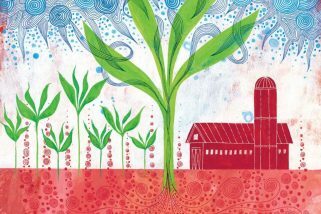 Emerging science proves that shifting to regenerative forms of agriculture such as agroecology, agroforestry, cover-cropping, holistic grazing and permaculture will allow us to store excess carbon safely in the ground. And, we have more good news to share: carbon-rich soils are full of life that provide multiple benefits. They improve the nutritional quality and yields of food; they filter and store fresh water; they support plants and wildlife, and they help to alleviate global poverty. Of course we need to reduce our CO2 emissions, but even if we magically stopped all CO2 emissions tomorrow, we would still be faced with dangerous levels of carbon already in the atmosphere. But, by restoring soil carbon on a global basis we can, over time, “draw down” that excess atmospheric carbon to safe levels and bring the carbon cycle back into balance. Climate change is a topic that can cause anxiety and helplessness, and it has been hard to know what to do beyond curtailing our energy usage.